No matter if you're a pro or beginner, you need grit to get to the next level. We offer intelligent, balanced training programmes, as well as a wide variety of group training and skills sessions to suit all abilities. We coach and mentor all levels of cyclist from beginner to elite. As coaches we believe in providing the very best support framework to ensure you achieve the most from yourself. Communication and contact are key. We provide custom and pre built training programmes depending on your needs as well as expert analysis and training feedback. We also use a network of specialist we can refer to make sure you achieve your very best. We provide you with the knowledge, understanding, accountability and a solid support network. We are always reaching further and help you focus and enjoy the process. Using Training Peaks we deliver personalised training programmes. Using the latest software and expertise we analyse and give feedback based on your training data. We offer a range of group rides, group training sessions and skills clinics. Grit Coaching is a community of like minded riders with a team mentality. We all support each other to get better. Sign up directly by going to Hire a coach page or contact us first to make an appointment via Skype or meet at a local cafe if you are Auckland based and talk through our coaching levels and process. If you are keen to meet up first then we go right to step two and answer any questions you might have. We meet up and talk through your specific goals, Training history, Time available to train. Plus a few other key areas to help the coach create an effective plan. We also go through our coaching process and software we use to deliver the training programmes and generally make sure we are on the same page. As well as cycling and strength and conditioning we also have a range of specialty partners which we have tried and tested extensively. Its all part of our aim to offer solutions and knowledge to any requirement you may have. We set up your Grit Academy account and start to create your training programme with either your own Training Peaks account or our own programme builder depending on your level of coaching. From here we get into the nitty gritty and you start your training. We constantly evaluate and refine your training. As well as use a very thorough process for delivering feedback to help you grow and learn as an Athlete. This is where the magic happens! Logan brings over 15years of racing experience both domestically and internationally as well as a degree in sport and exercise science from AUT University plus the experience of coaching 100+ athletes to success in National and World Age Group Championships, international stage races, ultra distance events like the Trans Continental and hundreds of goals achieved in many other events around the world and in NZ. Logan has ridden just about every event in NZ and knows what is required for all of them. 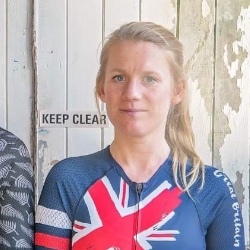 Emma Hadley, the other half of the coaching team, has a real passion for working with female riders to achieve their cycling goals. Along with Mark Taylor from Mt Eden Cycles she has created a women’s cycling group which has helped 100s of women to get into cycling over the past 3 years. Emma loves all things cycling from road biking, off road mountain biking, gravel adventure to ultra distance cycling events. She offers the support and knows how to give you the confidence to achieve even the biggest of goals. 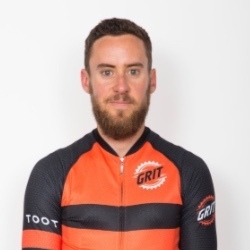 Paul Coles has been coached by Logan for over 6 years and in this time he has developed himself into a real leader of the Grit coaching group. Paul is extremely passionate about helping people improve and gain as much from the sport as he has. "Goal setting, strategic thinking and long term planning are at he core of what I do day to day from a work perspective" Paul believes in working backwards from a goal, deconstructing what it takes to achieve said goal and developing a plan to execute. Paul has had great success both coaching and in his own sporting endeavours. 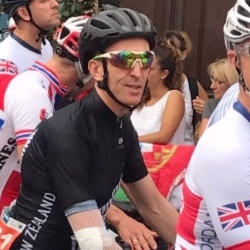 He has completed in a wide spectrum of events from age group world championships in Perth and France to completing 4laps of Taupo (630km non stop) in under 25hours. Contact us today if you would like to work with Paul. Alex Ray A.K.A The Grammar Hammer, Has raced all over the world from the Australia, U.S and all over Europe. 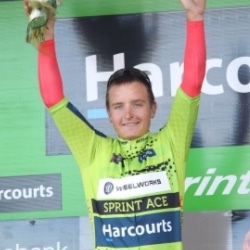 Alex is a green jersey winner in one of the most prestigious race in NZ the Tour of Southland and specialised in Crit racing in the states where he collected many wins. Alex has always been a coach throughout his racing career. Now Alex is focusing on coaching as his own career winds down. He passion is passing on the knowledge and support he has gained from racing at a high level.